The Seine River is one of the most scenic natural wonders of France, and it flows right through the city of Paris. Its romance and beauty has captured the imaginations of artists for centuries, and there are countless examples of Seine River art available to enjoy. The number of Seine River prints available is, in fact, so large, that there is sure to be one that suits every taste and style. 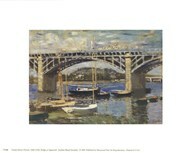 The most famous of all Seine River paintings are certainly the impressionist masterpieces of Claude Monet. 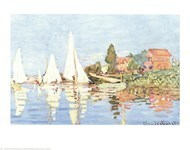 He was captivated by the lush greenery, the small sailboats, the bridges, and the reflections on the water, and although he created numerous works of Seine River art, he never tired of it. Viewers of his art, too, never grow tired of the playful colors and shadows, and these prints have a place in both traditional and modern styles of home decor. Monet was not the only famous painter entranced by this French river. Other renowned impressionists, such as Paul Gauguin, Paul Signac, Camille Pissarro, and Pierre-Auguste Renoir all created incredible examples of Seine River artwork. These artists created their paintings at different times of year, and with different color schemes for each season, there is a print to suit every color of room. Photography enthusiasts will also find Seine River photographs that fit their tastes. Both color and black and white prints capture the serenity of the river in the countryside, or the reflection of the lights from the bustling city of Paris. A black and white Seine River print makes the perfect romantic addition to any room, but especially a bedroom, decorated in the popular shabby chic style.